I agree wholeheartedly. The rather obcessive behavior regarding inflation that has become pervasive in our central banks is quite harmful in itself because their job isn’t so much about economic technicalities as it is about managing market expectations. So if they become overly protective of their inflation targets and forecasts, ignoring market realities, they can’t get out in front of any praticular crisis, which only makes the crisis bigger as damage happens and contagion becomes a reality almost with no end. It doesn’t really matter what the targets are or how well they are being met if markets do not trust that the CB’s will get out in front of issues so they don’t needlessly become larger. A bit more inflation is cheap comared to the real losses from contagion and lost opportunity because of lack of trust and the fear factor. In my view, the only way a change in “animal spirits” could impact spending on output is if it someone leads to an excess demand for money. And an excess demand for money is always the fault of the central bank, whose duty is to adjust the quantity of money to the demand to hold it. Of course, it is a difficult responsibility, because the demand for money isn’t directly observable, but by committing to return nominal GDP to a target growth path, it can always come close enough to avoid anything like a Great Recession. Stable growth in nominal expenditure does’t require that businessman on average have stable expectations. If we were on a gold standard, and the demand for gold was inversely related to “animal spirits,” then there would be a difficulty. Efforts to avoid sharp changes in interest rates or to stabilize some measure of the quantity of money has similar effects as a gold standard. Lars, 2008 october 13 swap line decisions were much more important than 2009 april swap line decisions. 123, judging from the market reaction – what happened in March-April was “enough” to turn around expectations. The actions in October 2008 didn’t do the job. It might be that it would have been even worse it the swap lines had not been introduced in October 2008, but my point is that ALL of the major turns in the US stock markets over the past fours can be explained by changes in monetary policy. With the precipitous drop in September 2008, could one add that Congress granted the fed the power to pay interest on excess reserves? So suddenly it becomes rational to expect a ceteris paribus rise the value of base money vs. stocks, bonds, loans etc. One thing that’s fascinating about this graph is that the decline in stock prices took place almost entirely before central bank rates in the US, UK and (I imagine) the ECB hit zero. Even for the most devoted believer in the liquidity trap, there was still plenty that monetary policy could have been doing in 2008. For those of us who see 0% central bank rates as political rather than economical constraints, this means that even the easy actions weren’t being taken while they were justified. I think we should take care when we use the phrase “Great Recession.” I agree that the failure of the Fed to satisfy skyrocketing money demand was the proximate cause of the downturn being as nasty as it was (and continues to be, perhaps?). However, there would still have been a market correction resulting from the bursting of the real estate bubble. We should make sure we distinguish this correction from the “secondary deflation” which put the Great in Great Recession. This is exactly the same point Milton Friedman made in his work on the Great Depression. The S&P500 has doubled in three years compared to four in 1933-1937. If the S&P500 is the metric of policy effectiveness, then Bernanke has FDR beat hands down. I think it is pretty clear that we are in a crisis which is much smaller in scope than in 1930s. That said, I sat out to demonstrate that market movements primarily is a reflection of monetary policy rather than animal spirits. I think I have demonstrated that pretty clearly. Furthermore, as I note the S&P500 is just one of many markets one could look at. European stocks have seen the same kind of market action. However, European stocks have traded sideways for the last three years. This is probably a pretty good illustration of the difference in monetary policy in the euro zone and the US. One could of course also have a look at bond yields or exchange rates. A thought experiment. Imagine MM’s were around in 1933, and were arguing for abandonment of the gold standard. Imagine also that you traveled from the future and described the situation in March 2009 and the Fed’s policy reaction. Would those 1933 MM’s predict a bigger stock market move from the gold market exit than from Bernanke’s “Credit Easing+Inflation Targeting” policy? Diego, that is an interesting thought experiment. I think the answer most say that the US monetary policies after 1933 was far from perfect. And the 1937-recession clearly shows that the US Treasury and the Fed had very clear problems about what they were targeting. In that sense the post-1933 period and the last four years are similar. In both case the Fed finally move to do something about undoing the tightening of monetary policy, but it was (and is today) within a highly discretionary regime. That was a problem in the 1930s – as it is today. MM’s generally argue that FDR had a much bigger impact on expectations than Bernanke. Its worth noting that market prices do not necessarily support this thesis. Its interesting to think about why something so substandard as Bernanke’s policy could produce a better market reaction than FDR’s gold exit. One thesis is that both moves were primarily directed at increasing business investment through higher profit expectations that drove higher asset prices. The Bernanke move quickly restored corporate profits-to-gdp to peak levels — an astounding recovery. The employment recovery, unfortunately, did not follow the same path. Could it be that profits impact worked in similar ways in ’33 and ’09, but, for structural reasons, the employment outcome differed? BTW, expected overseas profit growth does not account for the difference. Even the NIPA (domestic) profit recovery has been back to peak levels. Further, the domestic-heavy Russell 2000 has outperformed the S&P500. Once again thanks for your comments. They are very relevant and interesting. In fact these are issues that have been on my mind for some time – especially the recovery in NIPA profits. I am not sure that market monetarists in general is giving higher marks to FDR than to Bernanke. But of course the decision to leave the gold standard is seen as hugely important. That said, I am certainly no big fan of FDR’s economic policies. NIRA for example was a disaster and US Treasury played a huge role in the 1937-recession in my view. Anyway, your make a valid point. A study comparing the two “events” could clearly be interesting. I now have had a look at the numbers. I think they give an somewhat different picture than the one you paint. The recovery in Dow Jones from the bottom in early 1933 (February) and a year ahead was extremely impressive. Dow Jones rose more than 90% from the bottom. The recovery in Dow Jones was much weaker in 2009. Over 12 month Dow Jones was less than 50%. Hence, what FDR did in 1933 had a much more powerful impact on the US stock market than Bernanke did in 2009. And the FDR “outperformance” continues during the four following years. However, it is correct the Dow Jones is basically flat in 1934 and into 1935. That in my view is probably the NIRA effect. Anyway, I have done this fast – it would need more thinking, but I think it is pretty hard to say that Bernanke has been more positive for the US stock market than FDR are was (including the horrors of NIRA!). The various policy responses were subordinate to the actual unrecognized driver – monetary flows (our means-of-payment money Xs its transactions rate-of-turnover). Simply because most of the FED’s interdictions were ill-timed, the financial market’s reactions were decisive. Contrary to economic theory, & Nobel laureate Dr. Milton Friedman, monetary lags are not “long & variable”. The lags for monetary flows (MVt), i.e., the proxies for (1) real-growth, and for (2) inflation indices, are historically (always), fixed in length (mathematical constants). For example, as soon as Bernanke was appointed to the Chairman of the Federal Reserve, he initiated a “contractionary” money policy for 29 consecutive months, (coinciding both with the end of the housing bubble, & the peak in the Case-Shiller’s National Housing Index in the 2nd qtr of 2006 @ 189.93), or at first, sufficient to wring inflation out of the economy, but persisting until the economy plunged into a depression. A “contractionary” money policy (decelerating roc’s in nominal gDp prior to the Great Recession), is defined as one where the rate-of-change (roc) in monetary flows is less than 2% above the rate-of-change in the real output of goods & services. I.e., MVt’s roc’s were NEGATIVE (less than zero), for 29 consecutive months. The FOMC continued to drain liquidity despite its 7 reductions in the FFR (which began on 9/18/07). 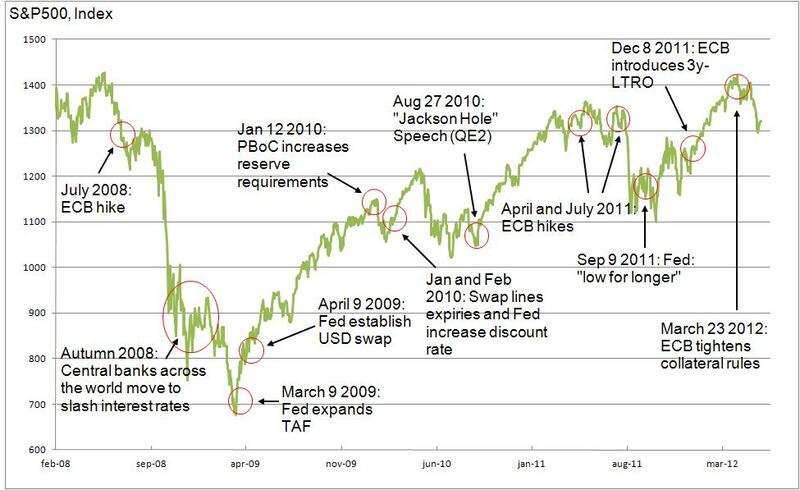 I.e., despite Bear Sterns two hedge funds that collapsed on July 16, 2007, & immediately thereafter filed for bankruptcy protection on July 31, 2007, the FED maintained its “tight” money policy [i.e., credit easing (mix of assets), not quantitative easing (injecting reserves)]. Nominal gDp’s 2 year roc peaked in the 2nd qtr of 2006 @ 12%. Bernanke let it fall to 8% by the 4th qtr of 2007 (or by 33%). It fell to 6% in the 3rd qtr of 2008 (another 25%). It then plummeted to a -2% in the 2nd qtr of 2009 (another [gasp] – 133%). The freefall in gDp during the 4th qtr of 2008 was disguised early on because the Commerce Department reported retail sales increased by 1.2% over October 2006, & up a huge 6.3% from November 2006. However (in Dec 2007), the roc in MVt projected a peak in the proxy for real-output during July – followed by NEGATIVE roc’s (less than zero) in Oct, Nov, & Dec of 2008. You are right. I was measuring the effect from the Gold Reserve Act, which was 1934. The appropriate date is probably April of 1933, when FDR forbid private ownership (thus telegraphing the end of the standard). The market actually tripled from that level. One thing I would say, however: the Russell 2000 is probably less manufacturing-heavy than the Dow of 1933, which reflects our services-dominant (and less monetary policy-elastic) economy. If we were to compare apples to apples, its possible the recovery of stock prices has been similar. In any case, thanks for setting the record straight on the Dow.